8/14/2013 UPDATE: One reader has reported an issue when installing the project template described here. My own experience was issue-free, and judging from other feedback on this post (both here and elsewhere on the web), so have most others. I am awaiting additional information from the commentor to establish what the problem might be (I suspect VS/Nuget configuration, or possibly he is using an Express version, which might require additional steps). If YOU experience difficulty, please do let me know in the comments. The default WebApi project template that ships with Visual Studio 2012 has a lot to offer in some respects, but is less than ideal for either learning your way through the impressive WebApi framework, or building a lean, mean API project with a minimal footprint. 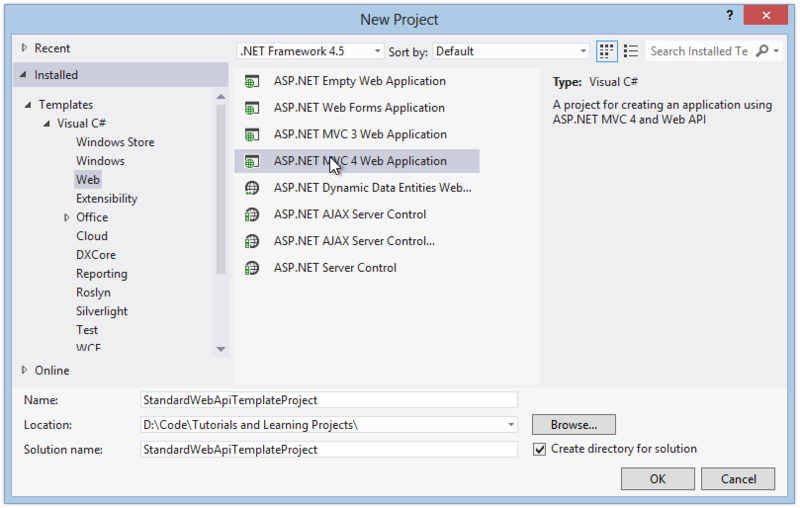 In this article, we will examine creating a simple and minimal WebApi project template in Visual Studio. 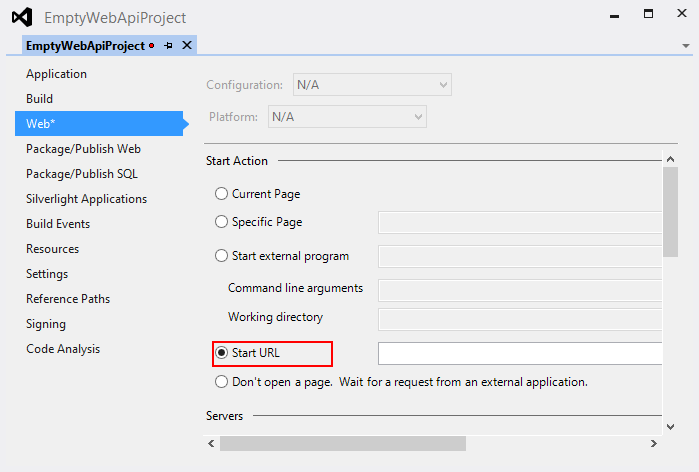 In the next article, we will look at building out the template into a simple, but illustrative example WebApi project. The default template in VS 2012 creates a project with no less than 40 references alone, which include a whole lot of stuff you may not want or need for your Simple API project. Also, the project created includes a morass of script files, images, Nuget Packages, and other supporting items for a fully-functional MVC site, but not needed for all API projects. In fact, there is a good chance your project needs only a fraction of the total. However, if you want to start simple, there's a lot to wade through here, and it can make figuring out what's going on rather challenging. Here is how to fix that. 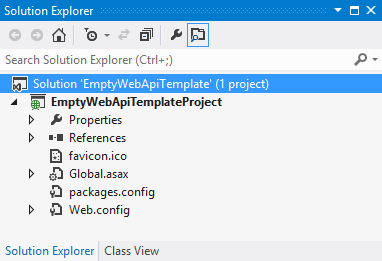 Nikos Baxevanis has authored a terrific installable template for WebApi projects which is really, really empty. 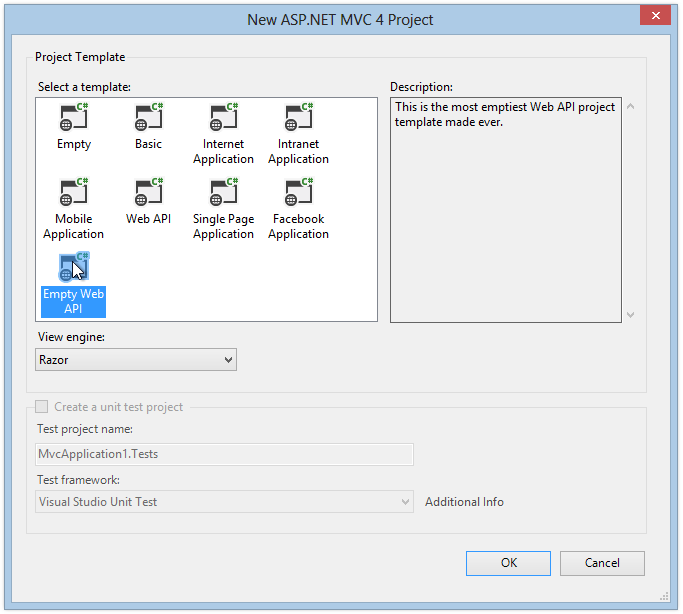 It installs into VS and is available as an ASP.NET MVC 4 Template through the File/New Project Menu. 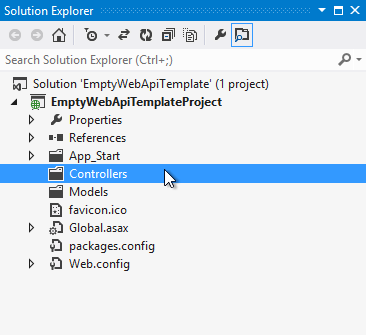 Once you install the template into VS, you can create a very empty WebApi project. After we add a few helpful items back in, we still end up with a project with less than half the dependencies, and a small fraction of the files found in the standard VS WebApi template project. At this point, we are almost, but not quite, done. Update all of the packages listed. Now that you have a more streamlined starting point, you will likely want to add a few things back in. 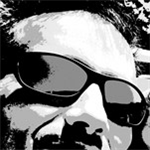 In order to take advantage of the awesome that the MVC Team has created with WebApi (and to follow the MVC philosophy emphasizing convention over configuration), we will want some routing, and probably (but not necessarily) we will want to adhere to some MVC conventions in our project organization. 9/9/2013 NOTE: For more information on ASP.NET Routing, and Route Customization, see Routing Basics in ASP.NET MVC and Route Customization in ASP.NET MVC. Since we are building a minimal API service and not a web site, we may want to modify what happens when we run our project in Visual Studio. Unless (or until) you plan to have your API project display a home page, you might consider setting the runtime property setting such that VS does not try to open your site in a local browser when debugging. 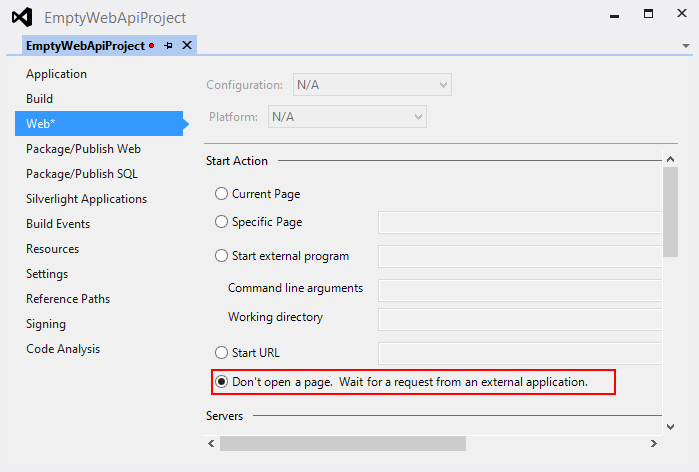 While the project will still run properly on whichever development server you have configured in Visual Studio, your default browser will try to open the page and show an error, which can be distracting. While you are here, scroll the window down, and take note of the Server Settings. 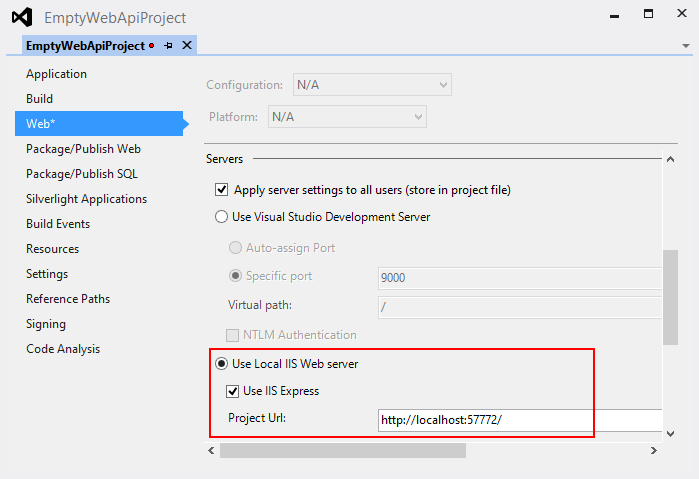 The default will usually be to use the Local IIS Web Server/IIS Express installed with Visual Studio. This is fine, but note the Project URL and specifically, the port setting. You will need to use this when consuming your API externally while debugging. Or, you may choose to switch to the Visual Studio Development Server and specify a port manually. In either case, when you call into your API Project from an external project while debugging you will need to use this as the root URL. You can clone this ready-to-build-out project as we've put it together here from my Github Repo, or download the Zip file. Beware, the repo is a little kludgy (especially if you navigate into the "packages" directory), as I included all of the Nuget Packages required so that the project will be fully functional out of the box. Note that cloning this project will not give you the installed template we examine in the post above. But you can clone this project, renamed appropriately, and build it out to suit. Also, if you find ways to improve on it, shoot me a pull request. I am capable of missing important stuff, and doing dumb things! Ready to Build it Out? 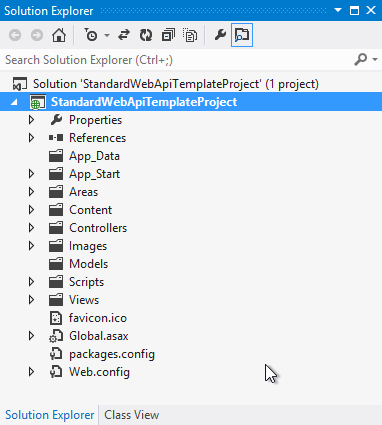 To this point we have examined how to install the empty WebApi template, and add the minimal additional items such as routing, filters, and a familiar folder structure needed to get an MVC-conformant API project ready to build. Next, we'll build out a basic example project using our streamlined WebApi Template. In VS2015, you get a minimal footprint out-of-the-gate with the built-in templates. That's good, because this page is filled with broken links, and some documented steps reference nuget packages that don't work with 2015. If you can, use 2015 and Web API 2 instead and you should be happy with the built-in templates. Yeah. This post is a few years old now, so obviously some things have changed. Absolutely, use VS 2015 and move forward. Sorry about the broken links. This article was pulled from my blog RSS feed, and I haven't circled around to updating all of these CP articles yet. My Vote of 4 - System.Web.Mvc assembly reference missing. First of all, good job and thanks for the sample. The System.Web.Mvc reference was missing from the template. Kindly consider fixing it. This is the error that occurs when trying to install for VS Express 2012. 30/05/2014 21:20:36 -   Description     : This is a much emptier project template for ASP.NET Web API. 30/05/2014 21:20:36 - VSIXInstaller.NoApplicableSKUsException: This extension is not installable on any currently installed products. Hmmm . . . looks like there's an issue with the Express edition. Perhaps try upgrading to VS 2013 express? My understanding is they have expanded the use of extensions for that SKU. Thank you for your prompt reply, but it does not work with the VS2013 Express edition either. It is likely a routing thing. Thank you John, its routing issue, I resolved it and it works fine. Thanx once again for your simplified way, it reduced my API size from 11.7 MB to just 1.15 MB. Sweet! Glad you figured it out! The default template certainly has a lot of stuff in it. Update is really a Downdate? Re: Update is really a Downdate? The date you are referring to reflects the date the article was last updated, not the original publication date. Adding a reference to System.Web.Mvc fixed the problem. Unfortunately, I can't repro the issue. When I follow the blog instructions step by step, the project is created with an existing reference to System.Web.Mvc. SAme when I pull down from my Github repo. Which way did you get the project? The follow up article is very good as well. Your reply to Daniel Marbach's comment (and to be fair his reply to you) should be a role model for everyone involed in online discussions! It definitely became for me! Thanks for reading, and the feedback! Indeed, I think folks around the web are too eager to be offended, particularly in the tech realm (most of us ARE "nerds" and often mean well, but don't always have the social skills of our B-personality brothers and sisters lol. I have found that, except when one is dealing with a simple "troll" it is almost always possible to bring a conversation back to civilized and friendly discussion simply by acknowledging the other parties point, and using it as a point of further inquiry. Clearly Mr. Marbach knew of which he spoke, and also took the time to comment, so I regarded it as an opportunity to engage someone who had some knowledge to offer. I know all to well that tone and context don't always translate well in email, text, and on-line comments! Again, thank YOU for reading, and taking the time to comment yourself. Just installed this and tried to create a new project using the template but received an error: "this template attempted to load component assembly NuGet.VisualStudio.Interop' ... What is even worse, when I tried to reopen the webapi project that I had created before with the original template, I get an error: "The operation cannot be completed. The parameter is incorrect." So it has broken that project too, hopefully I will not have to reinstall Visual Studio. Well, your experience is unique so far as I can tell . . . Do you have Nuget installed? And what version of VS are you using? It is most likely something to do with the configuration on your machine. Are you using an Express version of VS? There may be some special configuration needed for Nuget if so: Nuget Faq[^] (If this is your case, I will update the article to point this out). While I contend the article is valid as written, I would love to A. Determine what went wrong in your specific case, B. Help troubleshoot the problem, and C. Potentially post an update to the article notifying users if there is a configuration issue to be aware of. I understand your frustration, but is that really a solid reason to down vote a post, for what might end up being a configuration issue on your specific machine or VS installation? I don't it was necessary to down vote this article because it crashed your VS.
Do you mean you DON'T THINK it was necessary to down vote? Because, far as I can see, the original commentor is the only person who has had this problem, so I do NOT think he should be downvoting, at least until he determines there is in fact something wrong with the article content, as opposed to configuration or other issue on his end. Following the article worked perfectly fine for myself, and near as I can tell, for others as well. I WOULD be interested in figuring out where his problem came from though, so I can update the article for those who experience a similar issue (even if it is a specific configuration issue). Yes I forgot to put the word THINK in there. Good job on the article, looking forward to more. My vote of 5.